Name that reality show. Ever since middle school when I started watching LC on Laguna Beach it's been my dream to go visit the coastal town. Eight years later and mom and pop made my vacation dreams come true. We were actually in Newport Beach just north of Laguna. To my surprise I liked it even better than Laguna! Since the trip I've been watching Laguna Beach and Newport Harbor trying to pick up on more spots I may recognize now. Mom too! I loaded up on episodes for us to watch on the plane ride home. I may or may not have bought a shirt at Laguna Surf & Sport....come on I had to support Stephen's old place of work. If you are ever taking a trip to either, consult me. Mom, dad and I all agreed we did it just right. We were there the perfect amount of town, visited each important area, got just enough beach and pool time and hit up all the best restaurants. Started the trip on a sweet note with donuts from Roses. Seriously amazing maple old fashioned. The perfect fuel for our bike ride all up and down Balboa Peninsula. Took the ferry over the harbor for some more exploring. Got a frozen banana from, a staple for any trip to Balboa apparently. Headed back into Newport to get the tuna and salmon poke from Bear Flag Fish Co. Spent the rest of the day by the pool with a mojito in hand! Amazing dinner at Javier's! I'm talking lobster enchiladas!! Morning walk at Crystal Cove to walk off all the chips and salsa. The whole Crystal Cove beach area had this 1950's Gilligan's Island feel to it, we loved it. Suckered dad into a healthy breakfast after our walk. This pink smoothie was all his decision. I got a pink breakfast too, but went with the Pitaya bowl from Nekter. Recreating asap. Healthy breakfast was squashed after this, but lunch at Ruby's Shake Shack on the beach was no question. Dinner at The Beachcomber while the sun is setting is pretty hard to beat. With recommendations, we found ourselves the next morning at the most perfect breakfast spot. Zinc Cafe and Market was giving me all kinds of inspiro for the kind of place I'd love to open someday. Our orders were delivered and I immediately pulled out my phone. My parents were very patient with my food pictures this trip. The streets don't look like this in Oklahoma. Spent all Saturday popping around Laguna. Unfortunately no Kristen, Stephen or LC sightings. Dinner at 230 Forest Avenue made up for it. 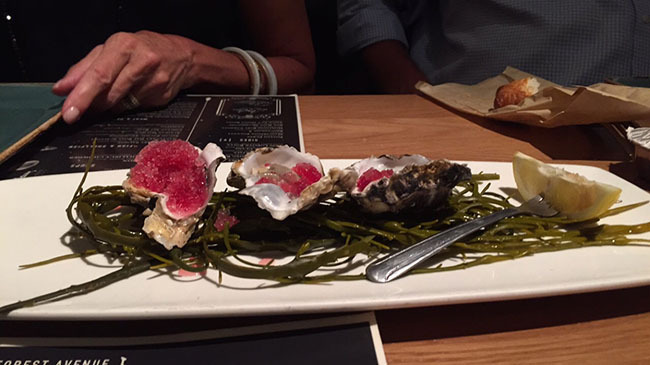 Those are oysters with pomegranate granita btw. My cioppino was just a take a bite picture waiting to happen. Full to our necks, but gelato was a must for our last night of the trip. Zinc day two because I was so obsessed. Who else has always wanted to eat an egg like this? Stinking cute. Finally one last bite of the trip at Bear Flag. A repeat restaurant stop because it was that good too. Fish tacos this time and amazing pico and chips. I got hooked on Have'A chips at home little to know they are made right here in Laguna! Props to mom and dad for being the best travel partners and props to southern California for stealing my heart. Good thing we all agreed we must go back next summer, oops!